Born 1937 in Tehran, Iran. Lives and works in Vancouver, Canada and Tehran. From 1960 on, Parviz Tanavoli became a pioneering figure in contemporary Iranian art, revisiting Persian traditions and modern sculpture. While he was studying art in Tehran in the mid-1950s, the Iranian government’s cultural policy was opening to Western practices, at the same time as encouraging the development of national and traditional arts. This led Tanavoli to study sculpture in Milan at the end of the 1950s and teach for two and a half years in Minneapolis in the early 1960s. Returning to Tehran and reflecting on the modernisation of Iranian art, his studio soon transformed into a hub for exhibitions and collective reflection. Gathering artists and poets, his studio, Atelier Kaboud, was the fertile ground for the formation of the Saqqakhaneh School. 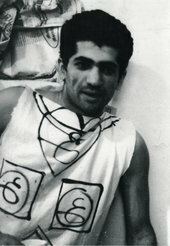 The most influential avant-garde movement in 1960s Iran, the Saqqakhaneh School developed a visual language drawing on popular culture and its symbols, re-appropriating traditions with a modernist stance. Parviz Tanavoli’s practice, developed throughout the 1960s and 1970s, is characterised by the modern incorporation of traditional techniques, notably everyday handicrafts found in the blacksmiths, foundries and pottery workshops of Tehran, and traditional subjects such as popular love stories as depicted in Persian poetry. Recurrent in his works are motifs taken from religious folk art, especially the saqqakhaneh, a votive fountain protected by metal grills. The Poet and the Beloved of the King 1964–6 is a striking example of Tanavoli’s re-appropriation of the evocative grill element, but extracted from its original significance by applying it to robot-like figures made out of brightly coloured, pop-inspired material. Revisiting poetic traditional love stories, his series of screenprints celebrates idiomatic Persian myths and symbols through a resolutely modernist visual language. Many of his works pay tribute to the legendary love story of Farhad, the only sculptor mentioned in classical Persian poetry, who challenged the Sassanian King Khosrow Parviz (r. 590 to 628), his rival for the hand of the beloved princess Shirin. Tanavoli reinterprets, throughout his works, this poetic legend as well as icons found in Shiite folk art, such as the cage, the lion, the lock and the bird, using geometric forms and new mediums. Interview with the artist Parviz Tanavoli, included in the World Goes Pop exhibition at Tate Modern.